In total, 27,827 artefacts have been recovered weighing a total of 90 stone (569kg), with a report about the findings expected to be published soon. 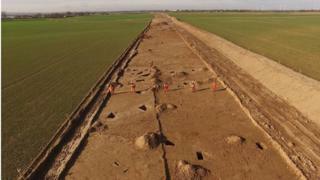 Wessex Archaeology, which have been carrying out the excavations, said 70 people had been working on the digs "with some pretty inclement weather at times". Renewable energy company Ørsted hopes the wind farm, which it claims will be the largest offshore site of its kind in the world, will be fully operational by 2020. A spokesperson said it was "delighted to see they've unearthed so many items spanning decades of history".